Luxury cottage style home located in Kennebunkport ME. A half mile walk to the restaurants and shops in Cape Porpoise. This luxury waterfront home features air conditioning, private dock, 2 bedrooms, 2 baths, living room, sitting room, dining room, and a full kitchen. 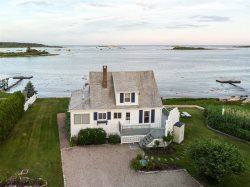 Enjoy the picturesque views over Cape Porpoise harbor from the master bedroom, living room, sitting room and wrap around porch. The home comes equipped with linens, towels, and kitchen cookware. Location, location, location with sweeping ocean and light house views. This is the perfect house for an amazing/relaxing stay in the Kennebunkport area. The house is in Cape porpoise and on the ocean. It has all the amenities you need for a great week. Highly recommend! Could not have asked for more. Sitting on th deck with the wonderful fall foliage in a lovely neighborhood watching the lobster boats coming and going. Easy walking around to the neighborhood restaurants and other views of the Cape Porpoise area. Jamie Mandell is great to deal with. Will return again.